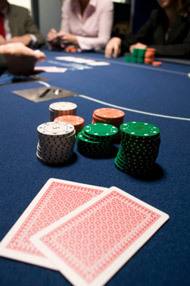 There are several options for blackjack players at the table during each game, as follows. You will use them anyway, no matter whether you count cards or not. After the first deal, you can double down by doubling your original bet. However, you can only take one more card after that. If you win, you will get a 2:1 payout on the overall doubled bet. Now, if you get a pair for your first two cards, you can choose to divide them into separate individual hands. Any cards worth 10 each (10s and face cards) are also considered pairs when it comes to splits. Both of the resulting hands will then be played independently from one another and a brand new bet that equals the first bet needs to be given to the brand new hand. Whenever another pair gets dealt on one hand, it can be split yet again to result in another hand. Several casinos have limits on the amount splits you can make in one play, though. Additionally, split hands cannot become blackjacks, even when a card worth 10 and an Ace make up your hand. Instead, it will just count as 21 as opposed to a natural. After the dealer checks and finds out he doesn't hold a blackjack, you can surrender your hand to get 50% of your bet back. Most of the time, this option only exists in non-American casinos, though. If the dealer shows an Ace, he can offer you insurance. Buying this refers to betting that he gets a blackjack. If he does, you get a payout of 2:1 of the insurance, which could reach 50% of your initial bet at most. A lot of beginners think this is smart, but professionals all agree that this bet is bad. Several casinos will let you double down when it comes to several split hands, but not all of them will. The chance to surrender prior to the dealer checking for a blackjack is called Early Surrender. Several casinos give out hands known as 5-card Charlies. If you hit until you get five cards in total and still don't bust, you will win a payout of 2:1. This rule won't apply after splitting, though, or if your dealer gets a blackjack.